Welcome back to the home of vintage enduro enthusiasts! WE WILL BE HOLDING THIS YEARS EVENT ON SATURDAY 13th October 2018. As you maybe aware Cooka is run on a Rolling 25 year format. This year the event is open to all Pre 94 bikes, meaning all bikes built on or before Dec 31 1993 are open to enter. 1 Day event held on Saturday only with a full days riding from 8:30 am to 5:00 pm. We'll end the day with dinner, presentation, and a prize raffle. Departure by 12:00pm on Sunday. Full details will be posted as the date draws near. Great stuff. Really looking forward to it. Hmm, I just noticed it's a week after veris Beaufort ride, could be a nice ten days away? Not to mention Classic Dirt the following week. I had originally planned to head up to Conondale but 3 weeks away riding might be a stretch. 1 Day event held on Saturday only with a full days riding from 8:30 am to 5:30 pm. I will update all the info and open entries this weekend. Your arms/hands are going good then I assume. Entries are now open for this year?s event. For those who haven't attended the event before, the loop is approx 15kms in length and is a nice mix of open and tight natural terrain sections, with an extended grass track. It is a MUST DO event on the Vinduro calender. This will be a 1 day event with riding on Saturday only. I am happy to announce that MCA Supermarket (Auburn) are back onboard again as the event's main supporter. A big thankyou to Jeff Curly at MCA for offering up some great prizes for Saturday nights raffle. Jeff has been a long time supporter of the event and has also participated in previous years aboard his 89 model KX500. All proceeds from this event go back to the Holbrook Motorcycling Sports Club. The event has now become a highlight on their yearly calendar. Entry to the property will be available from 1:00pm on Friday the 12th October, 2018. The club will be putting on a BBQ on Saturday night. Can you please indicate with your entry if you require dinner as we are counting numbers for catering. Camping will be available on Friday and Saturday nights ONLY NO CAMPING SUNDAY NIGHT. In keeping with our rolling 25 year criteria this event is open to all bikes manufactured up until 31st DEC 1993 (Pre 94). Sorry NO follow on models. Bikes must have a headlight fitted but does not have to work. To enter the event you must contact me via email and notify me if you are attending and if you require a 1 Day Rec Licence. If you don't reserve a licence then we may not have enough licences on the day and you will be unable to ride. and NO you cannot double children, friends, girlfriends, cats or dogs around the loop. and if you require an Event Licence or Not. The details to the event location will be sent out once you have notified me of your intention to ride at this event. Friday Gates Open Mid Day for Set up and Sign ons ONLY, NO test and tunes in the camping area. Saturday Rider briefing, loop open 8:30 am, Sign Ons continue. Loop Close 5.00/5:30 pm or earlier depending on numbers of riders out riding the loop and visibility. Only 1 Camp fire is allowed but Gas Heaters are welcome. You will need to bring plenty of drinking water and food for the weekend. Toilets will be on site in the camping area. All Rubbish must go home with you...Please don't leave your rubbish behind. Hi all, Only 3 weeks to go so don't forget to put your entry in. Also Some very kind members from the HMSC will be putting on a BBQ lunch on Saturday and a spit roast on Saturday night for dinner for entrants to purchase. Can you please indicate with your entry if you require dinner as they are counting numbers for catering. The details to the event location will be sent out once you have entered. This is a great event and one not to be missed. Hope to see You there. 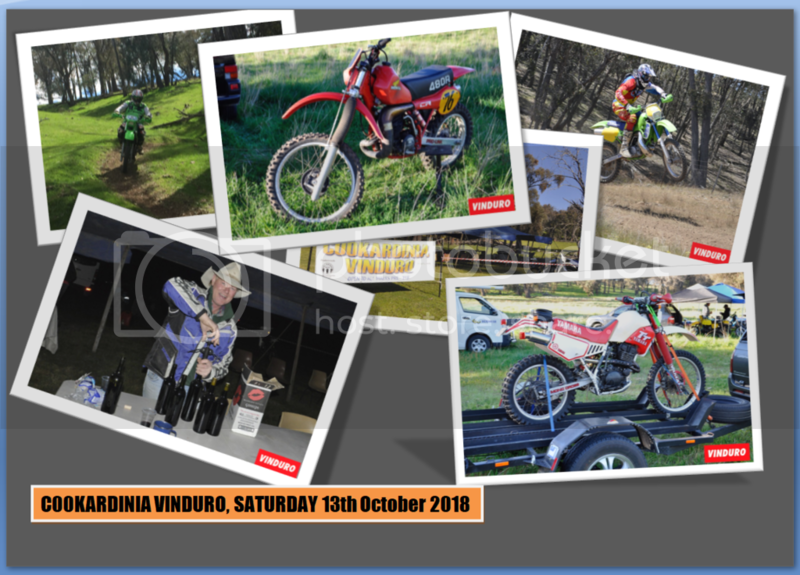 Only 2 weeks to go but there's still time to get your entry in for the 2018 COOKARDINIA VINDURO. Here's some pics from today's working bee. The loop is coming together great with some wide open areas to open up those big bores as well as some technical sections in between and as usual there will also be a winding grass track section. A big thankyou to Troy Shipard Ben Jones, Debbie Jones and all the other fellas (sorry I've forgotten all your names) that came out to the property to mark out the loop for this years event. In a nutshell it's an awesome loop. The beauty of this property "Bendemere" is that it is one of the very few tracks on the NSW Vinduro calender that caters for big and small bore motorcycles. There is the wooded section which is free flowing yet still has a few hidden gems like logs, cut backs and those truck tyres. Once you've conquered this section you then head out to explore the rest of the property which is fast and open. This is where the big bores are really in their element. We've also added in some creek beds to navigate and a grass track just for good measure. For those who are regulars you know what to expect and for those new to the Vinduro scene, we welcome you to the event. You're in for a great weekend. Just a heads up for entrants. The dinner option for entries closes tonight. So if you haven't notified me via email already and would like to purchase dinner on Saturday night please contact me ASAP. After some rain last week and a little more today riding conditions are looking great for the weekend so can't wait to get out there and cut some laps on my old DT400. Dinners entries maybe be closed but still not too late to get your entry in, you don't want to miss this one. Big thanks to all those involved in the Saturday night roast dinner, it was a fantastic way to finish off the day and also thanks to Buzz's Bikes & Bits Albury for providing the raffle prizes.